If you’re going on a camping holiday you don’t want to pack anything unnecessary. In fact, it is better if you can do more with less—for example, taking along any camping gear with which you can multi-task. For those of you who own the Thermomix, then you already know how much this one machine can do. And if you haven’t brought it with you on a camping holiday yet, then according to the many who have, you’re missing out. We’ve read over the forums and searched around the Internet and have compiled some easy Thermomix recipes and reasons why you should bring your Thermomix with you on your next camping holiday. Basically this one machine will save you time and energy and will keep you and your family eating well on your holiday. Dice, chop, blend, steam, cook, boil water and more – all with one machine. Source: Did You Remember The Milk? As far as power goes, you just need to either bring along a generator that allows for up to 1500W or you can plug it into the car or caravan’s system. Make sure to cook while running the engine so you don’t deplete the battery. Another option is to stay at a powered campsite so you can easily plug in your Thermomix and cook away. In addition to power, you need to be careful about how you pack your Thermomix for the trip in the car or caravan. Purchase a bag for it; it might even be worth it to buy the specialised carry bag from Thermomix. You’ll want to make sure to protect the feet of the machine, as that’s where the scales are located. Make sure to place it on a soft place during travel, especially if you’ll be going over any dirt roads. If you can do all this, the Thermomix will save you bringing along a bunch of other appliances and allow you to make some excellent food during your holiday. 1. Mix peanut butter, soy sauce, lemon, garlic, honey and curry powder together in shallow dish and place chicken tenderloins in dish, coat with satay sauce and leave to marinate while completing next steps. 2. Place water and olive oil in Thermomix bowl. 3. Measure rice into simmering basket and rinse with water under tap, then place simmering basket into Thermomix bowl. 4. Cut up veggies and place in bottom varoma tray. 5. Place a wet, scrunched piece of baking paper on top varoma tray, being careful not to cover all holes, to allow steam through to cook chicken. 6. Place marinated chicken tenderloins on baking paper and any remaining satay sauce on top. 7. Place varoma trays on Thermomix bowl and cook for 20 mins/varoma/speed 4. 8. Remove rice and check if chicken is cooked through. Cook chicken for a few more minutes on same temp above if not cooked. 1. Place the lid onto your empty Thermomix bowl and set to speed 8. Drop the garlic in through the MC hole onto the running blades, turning the dial off when you can no longer hear garlic hitting the blades. Add spring onion and oil and saute for 4 minutes on Varoma temp, speed soft. 2. Meanwhile, measure the couscous into the basket and place the stock paste on top of it. 3. When the onion/garlic finishes cooking, pour contents onto the couscous, then place the basket in place in the bowl, along with with water. Cook for 10 minutes on Varoma temp, speed 4. 4. While the couscous is cooking, place the pistachios and pumpkin seeds into a dry frying pan and toast for a few minutes, shaking the pan intermittently so they don’t burn. When seeds begin to pop, turn the heat off and leave to cool down. 5. Add asparagus in on top of the couscous and cook for a further 2 minutes, Varoma temp, speed 4, then remove basket from the bowl and pour contents into a large serving bowl. Run a fork through it if needed. 6. Empty the cooking water from the bowl and give a quick rinse under the cold tap, to cool the bowl down. 7. Place dressing ingredients into the bowl and process for 30 seconds on speed 7. 8. When couscous has cooled to room temperature, add to it the capsicum, basil and capers, along with 3/4 of the toasted nuts and seeds. Combine well with a large spoon. 9. Pour dressing over the salad and combine well, then top with remaining nuts and seeds to garnish. Put everything in Thermomix bowl and blend for 1.5 to 2 mins on speed 8-9. Then enjoy your delicious Thermomix smoothie! 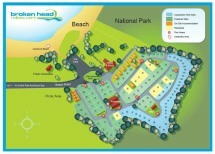 Book your next camping holiday at Broken Head Holiday Park where you can reserve a powered campsite. The powered site not only allows you to connect up to the electricity for recharging your smart phone and iPad but will also power up your Thermomix so you can make any of the delicious, easy Thermomix recipes we’ve directed you to in this post. So reserve your site now, pack up your Thermomix (carefully!) and get on the road for a fun camping holiday here in Byron Bay!